2 INVESTRAN DATA EXCHANGE AUTOMATING DATA CAPTURE AND REPORT DISTRIBUTION FOR ALTERNATIVE INVESTMENTS In today s alternative investment world, transparency of data is key, and the management and distribution of accurate data is even more important. Investors need information now not in weeks or months but rather minutes and seconds. An intuitive web-based solution, Investran Data Exchange enables users to provide secure, on-demand access of investment information to investors, portfolio managers and other stakeholders. By leveraging Investran Data Exchange, users can both streamline document management and data dissemination to improve global customer service to investors and increase internal productivity while lowering costs. USE INVESTRAN DATA EXCHANGE FOR: Fundraising Provide potential investors with secure, on-demand access to online investment information, including private placement memorandums, limited partner agreements, and due diligence questionnaires. Investor Relations Interact with limited partners in a secure web-based environment; disseminate personalized capital calls, K-1s, investment memos, and more. Portfolio Monitoring Provide deal teams, buyers, and sellers remote access to important documents; centralize and automate the collection of qualitative and quantitative information on your portfolio. Internal Document Management Archive and manage disparate documents in an online repository for easy retrieval. 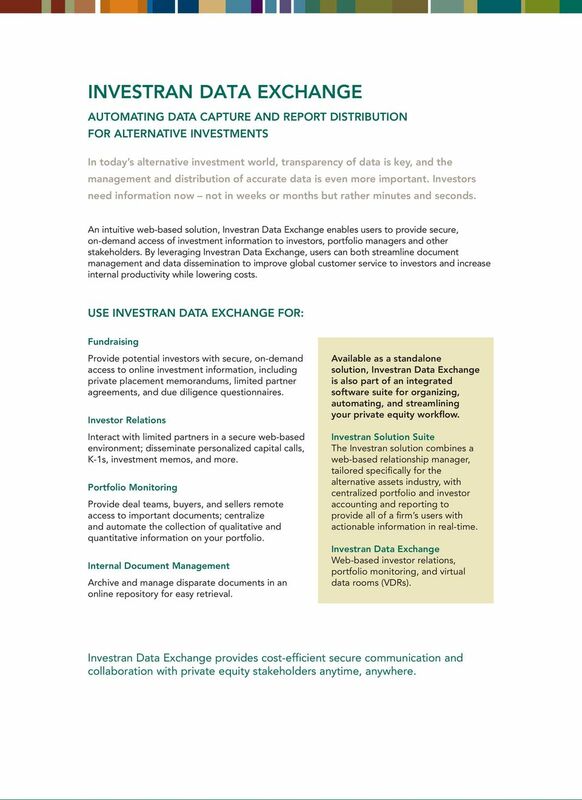 Available as a standalone solution, Investran Data Exchange is also part of an integrated software suite for organizing, automating, and streamlining your private equity workflow. Investran Solution Suite The Investran solution combines a web-based relationship manager, tailored specifically for the alternative assets industry, with centralized portfolio and investor accounting and reporting to provide all of a firm s users with actionable information in real-time. 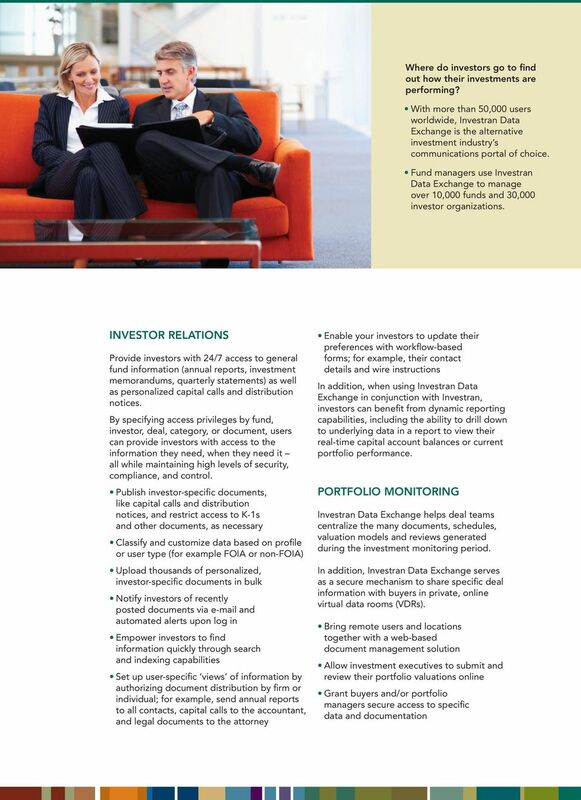 Investran Data Exchange Web-based investor relations, portfolio monitoring, and virtual data rooms (VDRs). Investran Data Exchange provides cost-efficient secure communication and collaboration with private equity stakeholders anytime, anywhere. 3 KEY FEATURES AND BENEFITS Distribute information securely through a password-protected web-based portal Provide 24/7 global online access to important documents Control information access using industry-standard communication protocols, including application layer authentication, password-protection, file encryption, Digital Rights Management (DRM), and document watermarking Eliminate printing, collating, and mailing costs through process automation and online information distribution Expedite fundraising and investment management, while adhering to internal and external compliance requirements Maintain focus on investing; SunGard administers and manages the application on your behalf (ASP) Customize data rooms with firm-specific colors and logos to mimic the look and feel of any corporate website Personalize workspace with alerts, bookmarking, and saved searches Collect and download multiple documents simultaneously using personal briefcases FUNDRAISING Investran Data Exchange simplifies the fundraising workflow while enhancing service capabilities. By distributing information through a professionally branded portal, users can maximize prospective investor interactions and reduce time-consuming research requests. Streamline the private placement memorandum development and approval process by collaborating online with fund managers and attorneys Control information distribution throughout your marketing cycle; continually narrow participant access to documentation as you move from premarketing to due diligence to road show Use audit reports to monitor investor interest Publish multiple investor-specific due diligence questionnaires simultaneously Make historical information available to prospects, including quarterly reports, investment memorandums, and portfolio summaries Watermark documents to protect them from forwarding and unauthorized distribution Investran Data Exchange can help improve the quality of discussions among portfolio managers, partners and investors. A web-based, multi-directional communications portal, Investran Data Exchange streamlines processes from fundraising and investor relations to portfolio monitoring and reporting, providing secure access to stakeholders anytime, anywhere. 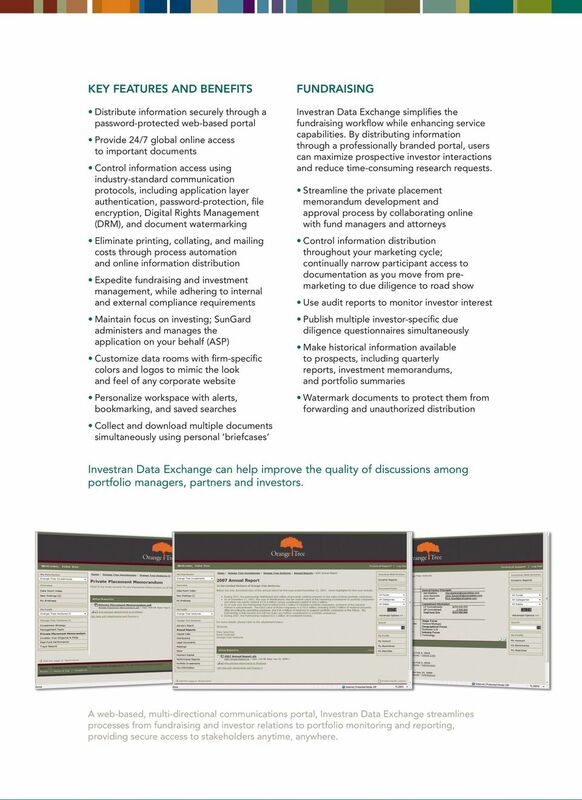 5 Leverage indexing capabilities to organize deal-specific documents Review and validate data submissions from portfolio investments with user-definable workflows and forms When used in concert with Investran, users can automate the collection of quantitative and qualitative form-based data from portfolio investments. Managers can quickly and easily submit pertinent investment data online, including updates to balance sheets, profit and loss data, and performance metrics. INTERNAL DOCUMENT MANAGEMENT Investran Data Exchange simplifies and centralizes internal document distribution, management and archiving. From human resources and personnel information to operational procedures and market research, Investran Data Exchange indexes and archives documents for easy retrieval and collaboration. SECURITY AND DEPENDABILITY When dealing with investors, security and confidentiality are key. 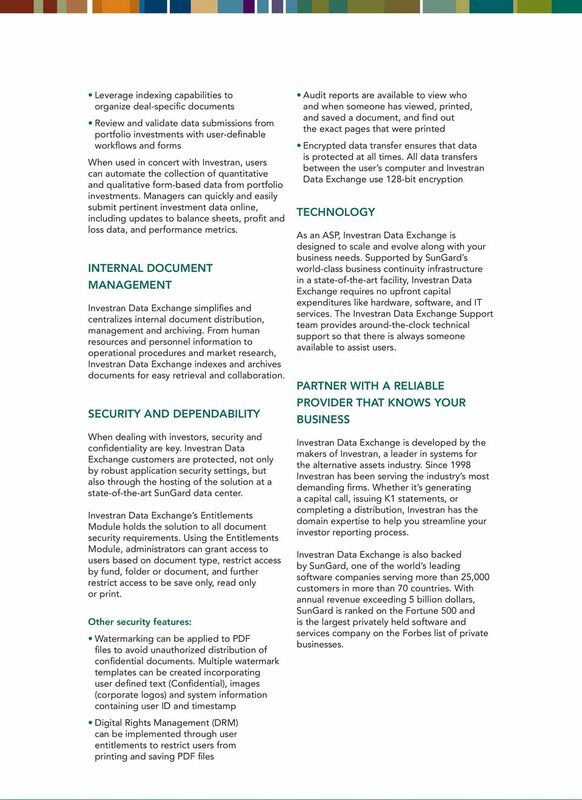 Investran Data Exchange customers are protected, not only by robust application security settings, but also through the hosting of the solution at a state-of-the-art SunGard data center. Investran Data Exchange s Entitlements Module holds the solution to all document security requirements. Using the Entitlements Module, administrators can grant access to users based on document type, restrict access by fund, folder or document, and further restrict access to be save only, read only or print. Other security features: Watermarking can be applied to PDF files to avoid unauthorized distribution of confidential documents. Multiple watermark templates can be created incorporating user defined text (Confidential), images (corporate logos) and system information containing user ID and timestamp Digital Rights Management (DRM) can be implemented through user entitlements to restrict users from printing and saving PDF files Audit reports are available to view who and when someone has viewed, printed, and saved a document, and find out the exact pages that were printed Encrypted data transfer ensures that data is protected at all times. All data transfers between the user s computer and Investran Data Exchange use 128-bit encryption TECHNOLOGY As an ASP, Investran Data Exchange is designed to scale and evolve along with your business needs. Supported by SunGard s world-class business continuity infrastructure in a state-of-the-art facility, Investran Data Exchange requires no upfront capital expenditures like hardware, software, and IT services. The Investran Data Exchange Support team provides around-the-clock technical support so that there is always someone available to assist users. PARTNER WITH A RELIABLE PROVIDER THAT KNOWS YOUR BUSINESS Investran Data Exchange is developed by the makers of Investran, a leader in systems for the alternative assets industry. Since 1998 Investran has been serving the industry s most demanding firms. Whether it s generating a capital call, issuing K1 statements, or completing a distribution, Investran has the domain expertise to help you streamline your investor reporting process. 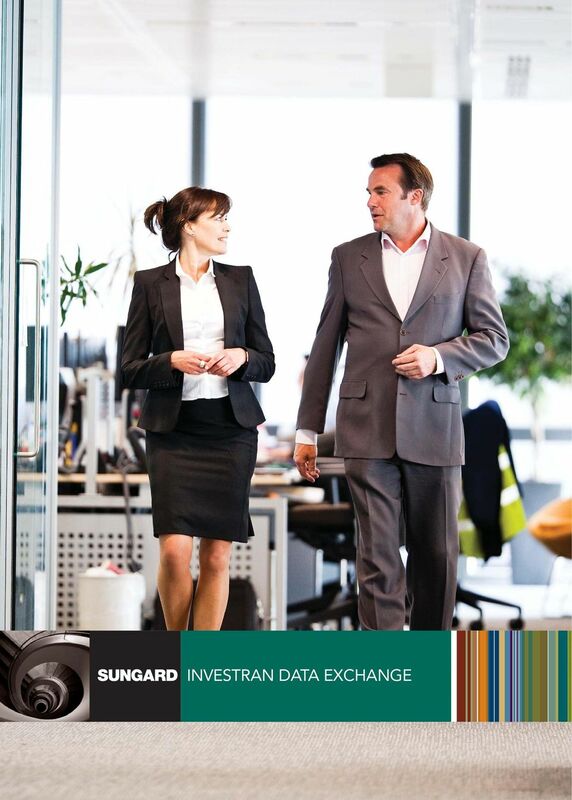 Investran Data Exchange is also backed by SunGard, one of the world s leading software companies serving more than 25,000 customers in more than 70 countries. 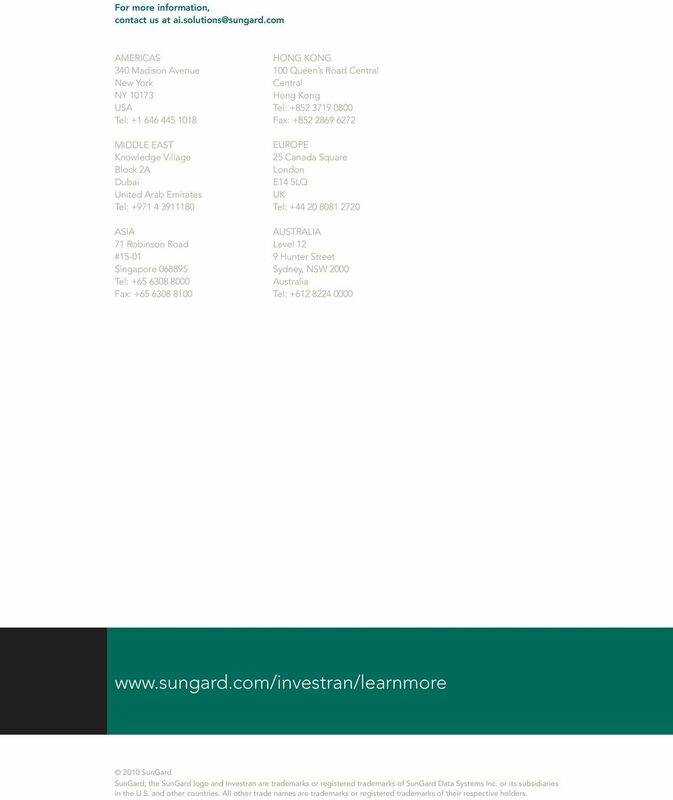 With annual revenue exceeding 5 billion dollars, SunGard is ranked on the Fortune 500 and is the largest privately held software and services company on the Forbes list of private businesses. 6 For more information, contact us at AMERICAS 340 Madison Avenue New York NY USA Tel: MIDDLE EAST Knowledge Village Block 2A Dubai United Arab Emirates Tel: ASIA 71 Robinson Road #15-01 Singapore Tel: Fax: HONG KONG 100 Queen s Road Central Central Hong Kong Tel: Fax: EUROPE 25 Canada Square London E14 5LQ UK Tel: AUSTRALIA Level 12 9 Hunter Street Sydney, NSW 2000 Australia Tel: SunGard SunGard, the SunGard logo and Investran are trademarks or registered trademarks of SunGard Data Systems Inc. or its subsidiaries in the U.S. and other countries. All other trade names are trademarks or registered trademarks of their respective holders. One trusted platform. All your project information. onesource workflow manager for Wealth Management TAX & ACCOUNTING improve processes for full compliance The more efficient your office, the better you can serve your clients and comply with regulations. Built with the leading Investment Banks, Law Firms, and Corporations. Our service is used by tens of thousands of professionals all over the world. REACH OUT SPEED UP TIMELINES SIMPLIFY NO TECHNICAL RESOURCES REQUIRED. Connect with donors and devotees across the globe easily by going online. Consolidate and control your company s expense information: increase efficiency, boost productivity and cut costs. MasterCard. Retail Banking Solutions Customised to Help Your Investment Decisions More success for investment advisors Retail banks have to meet increasingly high standards when it comes to providing customer advice.